Described by Mrs. Bolger as the ‘real descendent of the old harpers’. Her first harp was found in a bog and she was taught to play by her father. Later she obtained an Erard on which she mostly played her larger repertoire of traditional music. ‘I don’t think she had any further training but she was intensely musical, with a wonderful ear and excellent taste’ Mrs. Bolger continues: ‘Everything she played was arranged by herself, with the exception of a couple of arrangements made for her by the late Joseph Crofts. On one occasion she played at the St Patrick’s Day Concert at the Queen’s Hall in London and literally brought the house down with her rendering of Brian Boru’s March. I succeeded in taking down some of her arrangements, including the March, and some were published by Piggots. She had many pupils. (from the Irish Times, 6th Jul 1934, p.4, cited in Helen Lawlor, Irish Harping, p38). I do not know who taught Treasa Ni Chormaic, though her style and performance – e.g. Brian Boru’s march -reminded me much of Owen Lloyd. Owen Lloyd was an interesting figure in the Gaelic revival of the late 19th and early 20th century, playing on a wire-strung Egan Society harp, and who learned from traditional Welsh harpers. So do we assume the record, E3690, was issued late 1930 or early 1931? This begs a few questions about the instruments she played on during her lifetime. Ms. Cuthbert claims that “Her first harp was found in a bog…..” does she mean that the harp was built from bog wood, or that it was literally drawn up out of a bog? If the latter is true, wouldn’t it take an incredible amount of work to restore it? Is there any information about this instrument, and does it survive somewhere? Ms Cuthbert goes on to say “Later she obtained an Erard on which she mostly played her larger repertoire of traditional music.” To my knowledge Sebastien Erard never made a small harp, so she would have been playing a pedal harp, and since Erard died in 1830 this harp would have been over 100 years old at the time of this recording. However, Briggs specifically refers to the harp she played in 1934 as a “clarsach,” implying that it was a small harp. If she does represent the tradition of neo-Irish harp as it was in her lifetime, then it offers us an insight into the evolution of the style, especially if you compare her playing to successive generations of harpers, but if she played primarily on a pedal harp then I find it difficult to believe that her playing was intrinsically traditional, although contemporaries described it as such. Hi Lonnie. Some useful questions there. “found in a bog” – I think there is some serious myth-making and hagiography going on there! “Erard” – yes this would be an antique pedal harp. 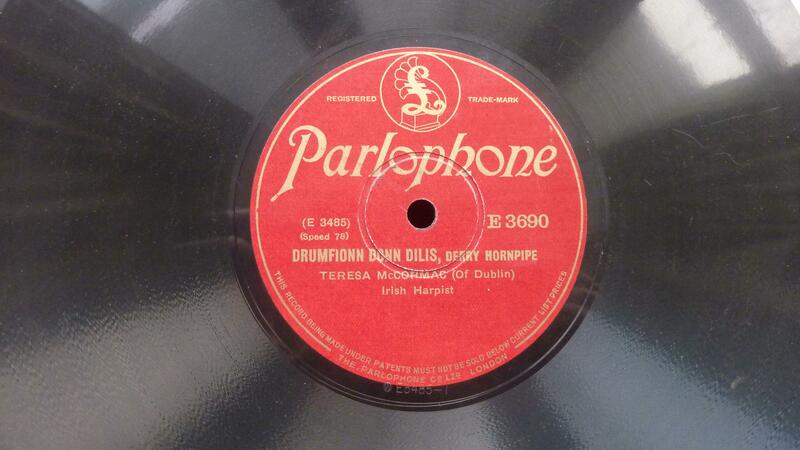 What the Irish Times journalist was describing in 1934 was when Briggs took harps to Dublin to exhibit, and she was his “demonstrator”, playing the new harps as part of the exhibition. I think you’re wrong to dismiss her pedal-harp playing as untraditional. There would be very little technical difference between the stringing, setup and sound of her old Erard and the new Briggs clarsachs. We should listen carefully to her style, her choices of what chords to play and especially where to play them, and her subtle phrasing and timing. These are the aspects that give her an important place in the tradition. After a bit of research I’m starting to agree with you about the Erard harp. It seems that early pedal harps had much lower string tension and narrower string spacing than pedal harps today, meaning that it would have been similar to traditional Irish and Scottish harps. Her choice of chords is indeed intriguing. I wonder if she ever sang while accompanying herself on harp, as many harpers of her time did? Do you think lever harp is more “traditional” than pedal harp for Irish and Scottish music? If so, do you think that has changed over time? All references I’ve seen only mention tunes. We’d have to dig deeper to try and find out more. This blog entry has stimulated me to do a bit of research in this direction, although I am far from an expert on the subject. I’ve been surprised to learn how much both pedal harps and Irish gut strung harps have evolved over the past 200 years. The movement toward wide string spacing and high tension strings in pedal harps didn’t begin until later in the 19th century, and it wasn’t until the time of Carlos Salzedo that the current setup took shape. The set up of an Egan royal portable and Erard pedal harp made in the same time would have indeed been very similar, although I believe the Egan harps had slightly narrower spacing and lighter tension so that they would be more suited to the market they were aimed at: aristocrtic ladies; I haven’t confirmed that though. I know that Irish traditional harps continued to favor even narrower spacing and lighter tension, but I’m not sure when this began to happen. I think her Erard harp would have been mush more suited to her particular style of playing than a classical harp built during her life time. 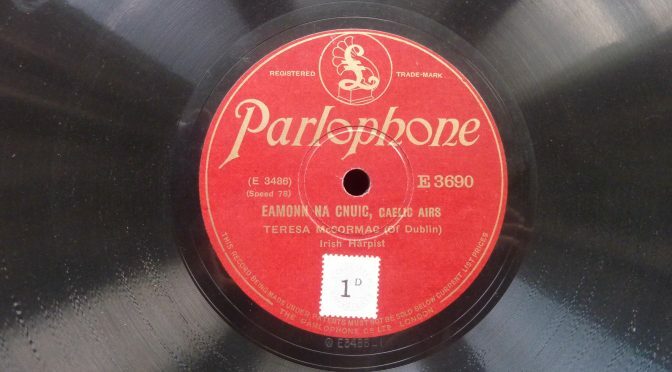 I recently acquired a used copy of “The Irish Harp Tutor,” by Sheila Cuthbert, , and there are one or two Teresa McCormac transcriptions in it. They are not the same tunes represented on this 78 record. It’s interesting to look at the sheet music and get a first hand sense of her particular style of arrangement, and to compare it to othe arrangements in that book. It really gives you a sense of the changes that occurred in Irish harping between the eraly 20th century and the late 20th century. Something else I’ve been wondering is whether Owen Lloyd strung his Belfast Society harp with wire, which it had been originally designed for, or whether he had restrung it with gut, which would have better suited his classical style of playing. All sources seem to assume that it was strung with wire. What’s your opinion on that, Simon? 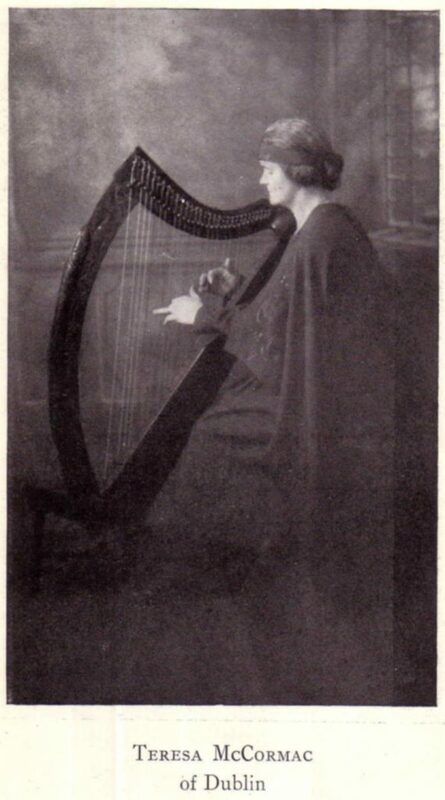 Have you read Mary Louise O’Donnell, “Owen Lloyd and the De-Anglicization of the Irish Harp”, in Éire-Ireland, Volume 48, Issue 3&4, Fall/Winter 2013, pp. 155-175? I would not say Lloyd’s style was “classical”; he started learning the harp with the Welsh harpist Thomas Thomas (Aptommas) (born 1829). Lloyd followed Thomas by playing with left-orientation like the older Welsh harpers. I just don’t know about his Irish harp, people assume it had wire strings but we’d need to look harder for a definite comment on this. Sometimes I wonder if it really matters, that musical style is more important than technical details of instrument design and setup. I have read the Mary O’Donnell article, I found it very interesting. How different would the Welsh technique Lloyd was taught have been from a standard classical technique I wonder? Are there any surviving arrangements of Lloyd’s tunes for us to examine? Apparently The Cork School of Music owns a harp that was once owned by Owen Lloyd, but I don’t know if it was his pedal harp or his Belfast Society harp. There is a discussion about Lloyd going on in the Celtic Harp Facebook group right now, I will let you know what they say about the harp in question. I believe Bonnie Shaljean would be the person to talk to about that, but I don’t know her personally. We’re waiting for her response to the Facebook post. Well the Welsh harp technique is left orientation for a start. I don’t know enough else about it – I need to do more research. Let us know if you find more about the harp. I thought his Hewson was in the NLI in Dublin.